In just 100 years, the chemicals and technologies of war-based conglomerates, which produced and profited from the chemicals that killed millions of people during the two world wars, continue to kill, wiping out millions of species by spreading poisonous agrichemicals, destroying our ecosystem, poisoning the entire web of life and are taking over every aspect that they can of our lives for financial profit. Corporations like Monsanto, Bayer, Dow, Dupont, Syngenta, all have their roots in warfare and through free trade neoliberal polices and deregulation of commerce, they enlarge their empire with mega buyouts. Such is the case with the most recent bid by Bayer to buy Monsanto for 62 billion euros facilitated by the European Central Bank. This in effect means public money being used to strengthen the monopoly of destroyers of life and people’s rights. These hallowed corporations of today, that have been tried and tested for crimes against humanity in the post war years, continue to use the same poisons that kill, but under the guise of being saviors of humanity. In just 2 decades these war criminals have fabricated ‘free’ trade agreements that are destroying the earth and pushing small farmers, the real producers of food, off the land. They have enlarged their control over our seed, robbing us of our food freedom, our human rights and our democracy. Through patents and intellectual property rights (IPRs), they have established monopolies, threatening farmers’ rights to seed, people’s rights to affordable medicine and people’s rights to healthy, nutritious food. The Hopi describe this phenomena as Powaqqatsi – “an entity, a way of life, that consumes the life forces of beings in order to further its own life”. Monsanto and Bayer have a long common history. They made explosives and lethal poisonous gases using shared technologies and sold them to both sides of the two World Wars. Bayer was part of I.G. Farben, Hitler’s financial core and stalwart chemical conglomerate and supplier of, among other poisons, Zyklon-B, a cyanide based pesticide used in concentration camps during the holocaust which was used as evidence in the Nuremberg trials, finding I.G. Farben and its partners, which included Bayer, BASF and Hoechst (Aventis) guilty of war crimes. Monsanto and Bayer had a Joint Venture – MOBAY – which supplied ingredients for Agent Orange in the Vietnam War. 20 million gallons of MOBAY defoliants and herbicides were sprayed over South Vietnam. As a result still today children are born with birth defects, adults have chronic illnesses and are dying of cancers. (http://journal-neo.org/2016/05/21/bayer-and-monsanto-a-marriage-made-in-hell/). Monsanto’s war against the planet and people continues today with the Round up Ready GMO/Glyphosate which has shown to be carcinogenic, as well as its BT cotton which has pushed millions of farmers into debt and suicide. (https://ecowatch.com/2016/05/29/urine-test-monsanto-glyphosate/). Across the world people are rising, democratic governments are responding to stop this ecocide and genocide. These giants have responded by attacking laws and policies of governments that take action in response to people’s movements and call to protect the earth and people’s rights. One of the now many examples is that of Bayer suing the Indian Government to retain its monopoly rights on its hazardous drug Nexavar . (http://www.politicalaffairs.net/bayer-sues-indian-government-to-retain-monopoly-right/). Over the last 2 decades since the TRIPS Agreement of the WTO, corporations have made every attempt to own life, our seeds, and our knowledge through intellectual property rights, using the instrument of patents on seed and life, propelled by greed and limitless power. In 1995, a Monsanto representative admitted that in the writing of the TRIPS agreement of the WTO they were the patient, diagnostician and physician all in one. 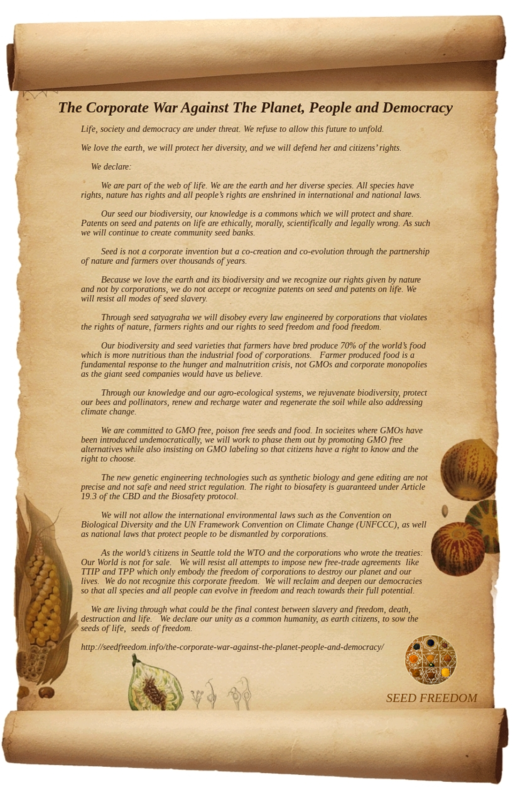 Through genetic engineering and by declaring that seed can be a corporate invention, and therefore can be owned by corporations, the door to patents was opened, allowing them to create monopolies, collect royalties from farmers, deny them their right to share and save seed, and rob them and citizens of their rights to seed and food sovereignty. In addition to safety issues, including genetic modification, synthetic biology and gene editing linked to GMOs, the overriding issue is the owning of life on earth. Patents on seed and life are unethical and immoral, they violate the integrity of life and violate the rights of farmers. The last two decades of experience with GMOs has shown that it is a failed technology – instead of controlling weeds and pests it has created super weeds and super pests. (http://www.ewg.org/agmag/2016/03/epa-watchdog-investigate-monsanto-gmos-and-superweeds). Despite this, patents, royalty collections and corporate greed continue to propel the spread of GMOs. While competition is the rhetoric of free trade agreements, monopoly is the outcome and as such they are destroying diversity, pluralism and democracy, the systems that protect our food, health and livelihoods. For example, India was forced to allow the entry of Monsanto in the name of competition. Today Monsanto controls 95% of the seed supply and has established a total monopoly pushing farmers into debt and suicide. Similarly, the global pharmaceutical giants, which are no different to the agrichemical and biotech giants, are attempting to destroy the generic drugs industry and affordable medicine. Through cross licensing agreements like these mergers and acquisitions, which of these will be in the cockpit will be decided by issues of image, and shedding liability and expanding monopoly rights through patents on non-inventions such as seed. While using the term ‘science’, these war-based corporations attack independent science and independent scientists to maintain and expand their empires. Corporate propaganda is their so-called science, and the science of biosafety by independent governments and scientists is branded “anti –science”. Independent scientists and journalists have been systematically attacked to maintain the lie that GMOs are the miracle panacea to feed the world and GMOs as an invention that justifies patent monopolies. As a consequence we have a Monsanto media, Monsanto public relations parading as science and governments that have been hijacked by the corporations, discounting all scientific evidence to continue imposing GMOs. Governments that made laws in accordance with international obligations to exclude patents on seed and patents on life and to protect biodiversity and prevent its biopiracy to protect their citizens, are now facing major attacks from the Monsantos of the world and the US government. Monsanto’s illegitimate monopolies on BT cotton seeds and illegitimate control of seed has led to their control of 95% of the cotton, to increased seed prices, trapped farmers in debt and to some 300,000 farmers committing suicide. A task force appointed by the government of Maharashtra, the epicenter of BT cotton as well as farmer suicides, has shown that wherever there is BT there are suicides and have termed them “killer crops”. With the widespread recognition of the failure of BT and HT technologies, the gene giants are rushing to push new tools of genetic transformation and genetic engineering such as synthetic biology and gene editing. They are doing this to bypass the biosafety regulation of GMOs that people across the world are demanding. Vermont has been sued by Monsanto to prevent its GMO labeling law. Monsanto’s attempt to introduce the DARK Act (Denying Americans the right to know) was only just recently rejected by the Senate. If GMOs are as safe and as good as the corporations claim, they would declare their products loudly and clearly. Their refusal to do so is an implicit knowledge of their harmful effects, which is why they spend millions of dollars to counter negative findings such as the report of WHO in 2015 attesting that Roundup/ glyphosate is a carcinogen. (http://sustainablepulse.com/2015/07/30/who-publishes-full-probable-human-carcinogen-report-on-glyphosate/#.V1QZGCN96VE). While Monsanto claims novelty to own seed and life it declares sameness and substantial equivalence to bypass biosafety regulation which assesses harm to the environment and public health. This is ontological schizophrenia. The same organism cannot be a new invention and natural at the same time. In the 20 years that patents on seed and life have been introduced by the chemical giants, they have today become the gene and seed giants. Armed with illegitimate patents on seed and life these multinationals began buying up smaller companies, shut down public breeding and destroying seed sovereignty and people’s food freedom. Concentration of control over seed is narrowing into a handful of mega-corporations. The “Big 6” pesticide and GMO corporations which own the world’s seed, pesticide and biotechnology industries are BASF, Bayer, Dupont, Dow Chemical Company, Monsanto, and Syngenta. Monsanto attempted to buy Syngenta which is now merging with ChemChina. Dow Chemical which bought up Union Carbide which was responsible for the Bhopal disaster and which still today is killing and maiming millions, is now merging with Dupont. Not to be outdone, Bayer is now buying up Monsanto. Through cross licensing agreements like these mergers and acquisitions, who will be in the cockpit will be decided by issues of image, shedding liability and expanding monopoly rights through patents on non inventions such as seed. Having contributed as much as 50% of greenhouse gases and climate change through a chemical and poison based agriculture, corporations are now stealing climate resistant traits that farmers have evolved over years to combat climate change. This is biopiracy of climate resilience, and more than 1500 patents have already been biopirated. Philanthropy has also come into the game with Bill Gates and his Foundation who, in partnership with these giant profiteers, is carving out new territories with their poisons, under the guise of doing good for humanity. (http://www.alternet.org/food/bill-gates-mission-sell-gmos-africa-hes-not-telling-whole-truth) . Using computer software and through genomic mapping, Gates and the corporations are taking patents on what farmers have bred through the ages. The Gates Foundation funds DivSeek, a mega piracy program of the biodiversity of the world – it is in control of the world’s gene banks, including the collection of farmers’ seeds held in the gene banks of CGIAR system. Bill Gates heavily invested his millions along with the Rockefeller Foundation in the frozen and static Svalbard Global Seed Vault in Norway. As much as 75% of global crop diversity exists outside the big institutional seed banks, and is held instead by some of the world’s most marginal farmers, most of them women. Precious funding would be better put to supporting a living and self-sustaining agriculture, helping farmers save, breed, and sow their own seeds, the proven path to feeding the hungry of the world. 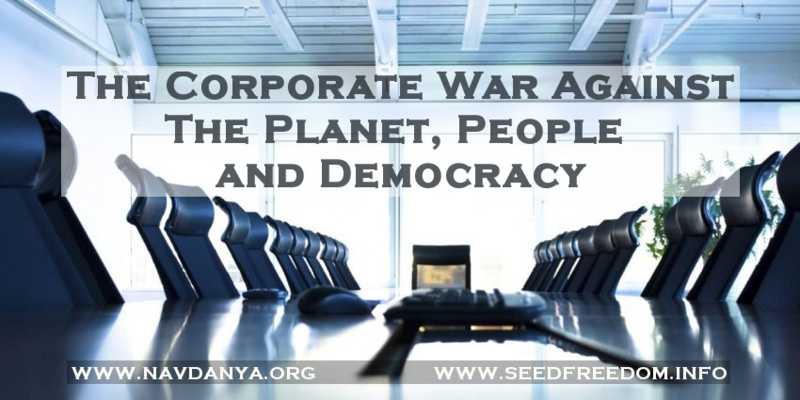 The toxic agenda of the war-based corporations and all-powerful foundations is based on false claims of innovation and invention of our seed, our heritage and life on earth, hijacking our governments, and attacking those that refuse to be hijacked. The attack on sovereign governments has intensified in the last few months as we see in the case of India, Argentina and Brazil. Such attacks on democratically written laws and democratically shaped policies made in the public and national interest, is a preview of the investor state disputes that have now been introduced in the current TTIP and TPP trade agreements. The Powaggatsi phenomena of the Hopi is clearly in evidence today – we are dealing with a destructive force that is taking out life forces wherever it can: If the corporations have their way our fragile web of life will be poisoned and broken, the diversity of species will be driven to extinction, people will lose all freedoms to their seed, to their food, to their knowledge and decisions. Life, society and democracy are under threat. We refuse to allow this future to unfold. We love the earth, we will protect her diversity, and we will defend her and citizens’ rights. We are part of the web of life. We are the earth and her diverse species. All species have rights, nature has rights and all people’s rights are enshrined in international and national laws. Our seed our biodiversity, our knowledge is a commons which we will protect and share. Patents on seed and patents on life are ethically, morally, scientifically and legally wrong. As such we will continue to create community seed banks. Seed is not a corporate invention but a co-creation and co-evolution through the partnership of nature and farmers over thousands of years. Because we love the earth and its biodiversity and we recognize our rights given by nature and not by corporations, we do not accept or recognize patents on seed and patents on life. We will resist all modes of seed slavery. Through seed satyagraha we will disobey every law engineered by corporations that violates the rights of nature, farmers rights and our rights to seed freedom and food freedom. Our biodiversity and seed varieties that farmers have bred produce 70% of the world’s food which is more nutritious than the industrial food of corporations. Farmer produced food is a fundamental response to the hunger and malnutrition crisis, not GMOs and corporate monopolies as the giant seed companies would have us believe. Through our knowledge and our agro-ecological systems, we rejuvenate biodiversity, protect our bees and pollinators, renew and recharge water and regenerate the soil while also addressing climate change. We are committed to GMO free, poison free seeds and food. In socieites where GMOs have been introduced undemocratically, we will work to phase them out by promoting GMO free alternatives while also insisting on GMO labeling so that citizens have a right to know and the right to choose. The new genetic engineering technologies such as synthetic biology and gene editing are not precise and not safe and need strict regulation. The right to biosafety is guaranteed under Article 19.3 of the CBD and the Biosafety protocol. We will not allow the international environmental laws such as the Convention on Biological Diversity and the UN Framework Convention on Climate Change (UNFCCC), as well as national laws that protect people to be dismantled by corporations. As the world’s citizens in Seattle told the WTO and the corporations who wrote the treaties: Our World is not for sale. We will resist all attempts to impose new free-trade agreements like TTIP and TPP which only embody the freedom of corporations to destroy our planet and our lives. We do not recognize this corporate freedom. We will reclaim and deepen our democracies so that all species and all people can evolve in freedom and reach towards their full potential. We are living through what could be the final contest between slavery and freedom, death, destruction and life. We declare our unity as a common humanity, as earth citizens, to sow the seeds of life, seeds of freedom.